Nylon bottom guide for pocket doors; jamb mounted; for 1-3/8" thick doors. Contents: 1 guide; 2- 3/4" x 15 ga. flat head drive nails. This guide uses slotted mounting holes to adjust a pocket door horizontally. Can be used with any door thickness. Lighter weight for hollow core doors. Sold in pairs. Brass plated diecast pull. Pull retracts from flush position. Fits On: a 5/8" x 3-1/2" mortise, 3/4" deep. Contents: 1 pull; 2 no. 8 x 3/4" Phillips flat head sheet metal screws. 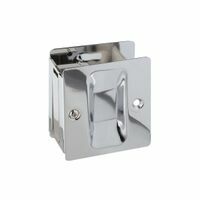 Bottom, jamb-mounted, universal-design 3-1/4"L x 1-1/4"H zinc plated steel bracket with 11/32"W white nylon tips. 1-5/8" opening for 1-3/8" thick doors. Includes four 3/4" x 15 gauge flat head drive nails. 2 piece bottom guide; jamb mounted; slotted mounting holes for horizontal adjustment of pocket door; for use with any door thickness. Contains 2 guides; 2 installation screws. Reversible handings with pull-out edge tab. Will fit 1-3/8" thick doors only. Mortise installation. Prime-Line Pocket Door Mortise Pull, Suitable For Use With: 1-3/8 - 1-3/4 in Thickness Doors, 2-3/4 in Length, 1-3/8 in Width, 2-1/2 in Depth, Solid Brass, Polished Size: 3-7/8" x 3/4" x 1-5/8". Slim pak - polybagged. Hardware kit for 1500 series pocket door frames includes: No.1120 hanger, No.1513 bumber, No.1550 guide, No.1712 adjustment wrench and screws. Mortise latch unit with privacy lock feature, and pull-out edge tab. Reversible; fits 1-3/8" thick doors. Latch engages and disengages by rotating round thumb turn. 1-3/8"W x 2-3/4"H. Heavy-duty hangers with 3 ball bearing equipped wheels for long, trouble free service - never needs lubrication. Height adjustable. 200 lbs weight capacity. 1" x 3" plate size. Tandem wheels; top mount steel hanger for pocket doors; 7/8" round edge nylon wheel; for 1-3/8" thick doors up to 75 lbs each; fits on Cox. Contents: 2 roller assemblies; 4 no. 8 x 1-1/4" Phillips pan head sheet metal screws. Sliding door lock and pull for passageway (pocket) doors; reversible; adjust from 1-3/8" to 1-3/4" thick doors. Contents: 1 lock and pull; 1 set of installation screws. Pocket Door Pull. Pocket door mortise latch unit. Pull-out edge tab. Fits doors from 1-1/4? to 1-5/8? thick. Includes flush pull on edge of door. 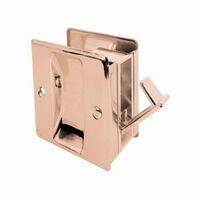 Manufactured of solid brass for maximum corrosion resistance. ncludes (2) wheel/bracket assemblies, (2) mounting plates, (1) wrench, (2) guides, (1) bumper, instructions, (2) floor brackets, (2) wall brackets, and all nails and screws necessary for assembly. Fits doors 1-3/8" to 1-1/2" thick. Pre-assembled for doors opening left to right. Plates are reversible for doors opening right to left. Dimensions: 1-1/2" D x 2-1/4" H.